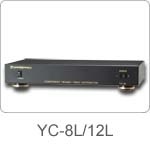 The YC-8L is an innovative Component Video(YPbPr) Distribution Amplifier, which is useful for signals distribution from high quality Video devices, Video game consoles, Video CDs, DVDs, Satellite Receivers, STB set-top boxes and etc.. The color of YC-8X is black and the dimension is 61(H)x422(W)x242(D)mm, which is bigger than YC-8X. 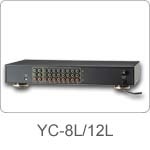 YC-8L supports 2 Video input and provides 8 output to HDTVs, LCD TVs, PDP TVs. That the 8 outlet distribution amplifier support Cable to run up to 200ft makes the output signal be as clean as the input signal. YC-8L can have a daisy chain to large number of televisions. Users can expand the TV quantity depending on what they need in actual condition. • 10Hz-150MHz super wide band. • Daisy chain to unlimited number of televisions with equal picture quality. • Switchable for 2 sets of input. • 8 sets of outlet can be connected with unlimited number of YC-8Ls. • Golden plated RCA connectors. • Transmitting distance runs up to 200ft.